Hardcover, 11 x 15.5 in. / 370 pgs / 385 color. 2012 was the 60th anniversary of Queen Elizabeth II's reign, an XL jubilee feted by Taschen Verlag with an XL coffee table book. 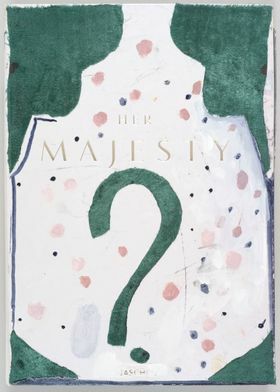 And now for a new version of Her Majesty: three Iranian artists, Ramin Haerizadeh, Rokni Haerizadeh and Hesam Rahmanian, have utterly overhauled the book. The extraordinary life of the world's most famous monarch now blossoms forth in majestic satire: the queen becomes a drag queen, the royal house Animal Farm, and the royal insignia mere stage props and rickety state coaches. This isn't heartless of the Iranian trio by any means, though, for they're actually helping the Queen to a life chock-full of absurdity beyond ritual and representation. Then again, does she even want all this freedom? Her Majesty? is a delirium of caustic wit, a cornucopia of waggish brainwaves and a grandiose masterpiece of draftsmanship and the art of collage. Ramin Haerizadeh (b. 1975), Rokni Haerizadeh (b. 1978) and Hesam Rahmanian (b. 1980) are living in exile in Dubai. In 2015 they exhibited at several venues, including the Kunsthalle Zurich and the Institute of Contemporary Art in Boston. Each copy comes with a handmade cover for this limited edition of only 600 copies. FORMAT: Hbk, 11 x 15.5 in. / 370 pgs / 385 color.